For the footballer who mostly played for Berwick, see Dave Moyes. David William Moyes /mɔɪz/ (born 25 April 1963) is a Scottish professional football coach and former player who is currently the manager of Sunderland. He was previously the manager of Preston North End, Everton, Manchester United and Real Sociedad. Moyes was the 2003, 2005 and 2009 League Managers Association Manager of the Year. He is also on the committee for the League Managers Association in an executive capacity. 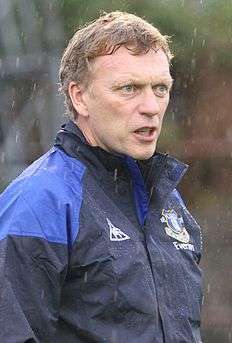 Moyes became manager of Everton in March 2002 and under him the club qualified for the third qualifying round for the UEFA Champions League in 2005 and reached the 2009 FA Cup Final. Upon reaching his 10th anniversary at the club Moyes received praise from many fellow managers including Sir Alex Ferguson, Arsène Wenger and Kenny Dalglish for his achievements at Everton. His service to Everton was also praised in Parliament by Steve Rotheram MP. He succeeded Sir Alex Ferguson as manager of Manchester United, but was sacked after 10 months, and subsequently spent 364 days at Real Sociedad in La Liga until he was sacked. In July 2016, Moyes replaced Sam Allardyce as manager of Sunderland. As a player with Cambridge United, Moyes received abuse from team-mate Roy McDonough for his religious beliefs; Moyes is a practising Christian. McDonough felt that religion was distracting them from focusing on playing; speaking of Moyes, Alan Comfort and Graham Daniels, he said: "The three of them sat in the changing room with a little black book, discussing their faith, when they should have been getting psyched up for a relegation scrap." Following a 3–3 draw with Wigan Athletic on 9 March 1985, McDonough, who was 26 years old at the time, states that he "battered" 20-year-old Moyes for not putting sufficient effort into the game. Moyes captained Scotland at U18 age group level. He played under former UEFA Technical Director Andy Roxburgh in 1980. His first game in charge was against Fulham at Goodison Park. Everton won the game 2–1, with David Unsworth scoring after just 30 seconds. Prior to Moyes's appointment, Everton Chairman Bill Kenwright contacted Moyes and invited him to his home in London to discuss the available position at Everton. Moyes was reluctant as he was driving from Preston to Bristol on a scouting mission, he was looking at Nathan Ellington. After the game, Moyes drove from Bristol to London where he met Kenwright for an hour, after the meeting he drove back to Preston from London – a 550-mile round trip. Moyes prepared for his first full season in charge at Everton by signing Chinese international Li Tie, Nigerian defender Joseph Yobo and goalkeeper Richard Wright and released older players such as Jesper Blomqvist and David Ginola. Everton were edged out of qualification for the following season's UEFA Cup on the last day of the season by Blackburn Rovers, following a defeat by Manchester United, and finished seventh in the league. Moyes was awarded LMA Manager of the Year for the first time, to go with the Premier League Manager of the Month award for November 2002, when the Toffees had been in the Champions League places. For the 2003–04 season, Moyes signed Kevin Kilbane from Sunderland, James McFadden from Motherwell, Nigel Martyn from Leeds United and Francis Jeffers returned on loan from Arsenal. Poor results followed though and Everton did not win a game in 2004 until 28 February. A confrontation between Moyes and Duncan Ferguson at Everton's training ground was said to be symptomatic of the problems at the club. 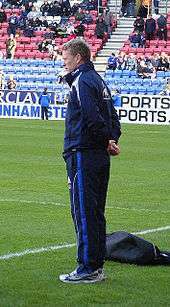 On 12 April 2003, Moyes was sent to the stands during a game against West Bromwich Albion by referee Steve Bennett for using foul and abusive language and for improper behaviour. Everton finished 17th with 39 points, the lowest total in the club's history (although survival had been confirmed some time earlier), just avoiding relegation. Moyes was manager of Everton for 11 years. In May 2013, following Ferguson's retirement at Manchester United and with his own contract expiring at the end of the season, Moyes informed Everton that he would leave the club to succeed Ferguson. Moyes replaced Sir Alex Ferguson as manager of Manchester United in 2013. On 9 May 2013, Manchester United announced that Moyes would take over the club following Alex Ferguson's retirement as manager. He signed a six-year contract with the club, and officially took up his managerial position at United on 1 July 2013. His first unofficial game as United manager ended in defeat as Teeratep Winothai scored the only goal for Singha All Stars in Bangkok on 13 July 2013. On 11 August 2013, he won his only trophy with Manchester United in his first official game, a 2–0 win over Wigan Athletic in the FA Community Shield. Less than a week later, he won his first league game in charge of the club, opening the season with a 4–1 victory against Swansea City, but after that, United suffered their worst ever start to a Premier League season, leading the start of his reign to be described as "calamitous" following a 4–1 defeat by Manchester City and a 2–1 home defeat by West Bromwich Albion, with several journalists stating the pressure was now on despite it being early in his reign. In January 2014, United were knocked out of the FA Cup in the third round by Swansea City, losing 2–1 at home, and lost in the semi-final of the Football League Cup, with Sunderland winning a penalty shoot-out. Following consecutive 0–3 home defeats against Liverpool and Manchester City, a flypast was staged by United fans with the banner displaying "Wrong One - Moyes Out" in seven-foot high lettering during a home match against Aston Villa in March. After the match, which United won 4–1, Moyes said the majority of fans had been "very supportive" of him. The club reached the quarter-final stage of the Champions League, after beating Olympiacos, but were defeated 4–2 on aggregate by Bayern Munich. On 22 April 2014, Manchester United announced that they had sacked Moyes. Moyes was in charge of United for 10 months, the third shortest managerial stint in United history and the shortest in 82 years despite calls from several respected ex-Manchester United players such as Denis Law and David Beckham calling for Moyes to be given more time at the club. 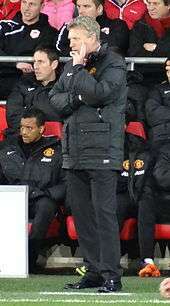 At the time of his sacking, United were seventh in the Premier League table, 13 points behind fourth-placed Arsenal with four matches remaining, ensuring United would fail to qualify for the Champions League for the first time since 1995 and finish outside of the top three for the first time in Premier League history. Moyes had won five points from a possible 24 against Liverpool, Chelsea, Manchester City, and Arsenal (the top four at the time of sacking). He was replaced in the interim by long-serving player Ryan Giggs and permanently by Louis van Gaal. Moyes was awarded £5 million in compensation following the sacking. Moyes as a coach of Real Sociedad in 2015. On 23 July 2016, Sunderland confirmed the appointment of David Moyes as new manager, replacing Sam Allardyce, thus making a return to the Premier League since April 2014. Moyes is a Christian and says he goes to church whenever he can. He is a supporter of the Labour Party and in 2010 backed Andy Burnham to be leader in the Labour Party leadership election. As a boy, he grew up supporting Rangers despite playing for Old Firm rivals Celtic. On 22 May 2014, Moyes was investigated by police after an alleged assault on a man at a wine bar in Clitheroe, but no action was taken by police. 1 2 3 4 5 6 7 Hugman, Barry J., ed. (1998). The 1998–99 Official PFA Footballers Factfile. Harpenden: Queen Anne Press. p. 211. ISBN 978-1-85291-588-9. ↑ "Managers Pay Tribute To Moyes". evertonfc.com (Everton FC). 13 March 2012. Retrieved 18 March 2012. ↑ "Moyes' Parliamentary Praise". evertonfc.com (Everton FC). 14 March 2012. Retrieved 18 March 2012. ↑ James, David (11 May 2013). "Silence speaks volumes on how Sir Alex Ferguson ran Manchester United". London: Guardian. Retrieved 18 May 2013. 1 2 Moore, Glenn (13 May 2013). "How David Moyes and 'the god squad' infuriated a former team-mate with their Christian faith". independent.co.uk (Independent Print). Retrieved 14 May 2013. ↑ Viney, Matthew (9 May 2013). "David Moyes: From Shrews to Manchester United?". Shropshire Star. Midland News Association. Retrieved 23 April 2014. ↑ "Former U18 Schools' Internationalists". Scottish FA. 22 February 2012. Retrieved 12 May 2013. ↑ Northcroft, Johnathan (12 May 2013). "Quiet please: winner at work". The Sunday Times. Retrieved 12 May 2013. ↑ "Moyes' lofty ambitions". BBC Sport (British Broadcasting Corporation). 14 March 2002. Retrieved 20 January 2009. ↑ "Moyes stays at Preston". BBC Sport (British Broadcasting Corporation). 11 June 2001. Retrieved 7 February 2012. 1 2 3 "Everton F.C. – Profile". evertonfc.com (Everton FC). Retrieved 22 April 2014. 1 2 "Moyes sets sights". BBC Sport (British Broadcasting Corporation). 15 March 2002. Retrieved 20 January 2009. ↑ "Winning start for Moyes". BBC Sport (British Broadcasting Corporation). 16 March 2002. Retrieved 20 January 2009. ↑ "David Moyes". evertonfc.com (Everton FC). Retrieved 20 January 2009. 1 2 "League Managers Association". Archived from the original on 30 May 2009. Retrieved 20 January 2009. ↑ "Season Review 03/04". evertonfc.com (Everton FC). November 2003. Retrieved 20 January 2009. ↑ "Moyes may face FA rap". BBC News. 12 April 2003. ↑ "Attendance History". Toffeeweb. Retrieved 5 March 2009. ↑ Harlow, Phil (21 July 2004). "Everton in turmoil". BBC Sport (British Broadcasting Corporation). Retrieved 20 January 2009. ↑ Paolo Bandini & agencies (1 September 2006). "Rooney book could be pulped". The Guardian. London. Retrieved 5 March 2009. ↑ Gammell, Caroline (6 March 2008). "Wayne Rooney settles autobiography libel dispute". The Daily Telegraph. London: Telegraph Media Group. Retrieved 5 March 2009. ↑ "Moyes wins libel pay-out after Rooney book claim". ESPN FC. ESPN Internet Ventures. 3 June 2008. Retrieved 20 January 2009. ↑ "English Premier League – Fair Play – 2007/2008". ESPN. Retrieved 20 January 2009. ↑ Gray, Sadie (18 November 2008). "David Moyes fined 5000 for improper conduct". The Times. London. ↑ "Moyes signs new deal at Everton". BBC Sport (British Broadcasting Corporation). 14 October 2008. Retrieved 20 January 2009. ↑ "DAVID MOYES DISMISSES ASTON VILLA LINK | Football Transfer News, Football News, Fixtures, Results, Match Reports, Stats". Sportinglife.com. 14 August 2010. Archived from the original on 27 October 2011. Retrieved 5 March 2012. ↑ "David Moyes fined £8,000 after admitting improper conduct charge over ref rant as Everton drew with Manchester United". Daily Mail. London: Associated Newspapers. 16 September 2010. ↑ "'One Of My Finest'". evertonfc.com (Everton FC). 31 January 2012. Retrieved 1 February 2012. ↑ "Everton 2–1 Sunderland". BBC Sport (British Broadcasting Corporation). Retrieved 10 November 2012. 1 2 3 4 "David Moyes & Man Utd: Boss tells Everton he wants to leave". BBC Sport (British Broadcasting Corporation). 9 May 2013. Retrieved 9 May 2013. 1 2 "Manchester United appoints new manager". ManUtd.com. Manchester United. 9 May 2013. Retrieved 9 May 2013. ↑ Stone, Simon (13 July 2013). "David Moyes loses first game as United manager". London: The independent. Retrieved 6 October 2013. ↑ "Man Utd 2–0 Wigan". BBC Sport (British Broadcasting Corporation). 11 August 2013. Retrieved 11 August 2013. ↑ Jackson, Jamie (30 September 2013). "David Moyes at Manchester United: where is it all going wrong?". The Guardian. Guardian News and Media. ↑ Rich, Tim (28 September 2013). "Manchester United 1 West Bromwich Albion 2 match report: David Moyes under pressure as Albion show magic is gone". The Independent. London: Independent Print. Retrieved 30 September 2013. ↑ Brown, Oliver (28 September 2013). "Manchester United manager David Moyes feels heat after shock 2-1 home defeat by West Brom". Daily Telegraph. London: Telegraph Media Group. Retrieved 30 September 2013. ↑ "Manchester United 0 Newcastle 1". BBC Sport (British Broadcasting Corporation). 7 December 2013. Retrieved 11 December 2013. 1 2 "Champions League: Manchester United among favourites - Moyes". BBC Sport (British Broadcasting Corporation). 11 December 2013. Retrieved 11 December 2013. ↑ "Man Utd: I'll take full responsibility, says David Moyes". BBC Sport (British Broadcasting Corporation). 9 December 2013. Retrieved 11 December 2013. ↑ "Manchester United 1 2 Swansea". BBC. 5 January 2014. ↑ "'Moyes Out' banner flown over Old Trafford". ESPN.co.uk (ESPN Sports Media). 29 March 2014. Retrieved 29 March 2014. ↑ "Manchester United: David Moyes defiant despite plane protest". BBC Sport (British Broadcasting Corporation). 29 March 2014. Retrieved 10 April 2014. ↑ "Bayern Munich 3 1 Man Utd". BBC Sport (British Broadcasting Corporation). 9 April 2014. ↑ Ladyman, Ian (17 September 2013). "David Moyes sacked: Manchester United manager told by Ed Woodward in Carrington meeting with Ryan Giggs to take over until end of season". Mail Online. Associated Newspapers. Retrieved 22 April 2014. 1 2 3 4 "David Moyes: Manchester United manager sacked by club". BBC Sport (British Broadcasting Corporation). 22 April 2014. Retrieved 22 April 2014. ↑ Shergold, Adam (27 October 2013). "Moyes can emulate Busby and Ferguson if given time to build another great United team, says Old Trafford legend Law". Mail Online. Associated Newspapers. Retrieved 19 November 2014. ↑ Atwal, Sanjit (15 September 2014). "Exclusive: Exclusive: David Beckham talks about England's midfield, Man United's signings and stats in football". Squawka News. Retrieved 19 November 2014. ↑ Jolly, Richard (22 April 2014). "Moyes' United stint shortest in 82 years". ESPN FC. ESPN Internet Ventures. Retrieved 22 April 2014. ↑ "United confirm David Moyes sacking". ESPN. 22 April 2014. Retrieved 22 April 2014. ↑ "Manchester United: Louis van Gaal confirmed as new manager". BBC. 19 May 2014. Retrieved 19 May 2014. ↑ "Sacked David Moyes to get £5m compensation". HR Grapevine. 22 April 2014. Retrieved 28 October 2014. 1 2 "David Moyes appointed as Real Sociedad manager until 2016". The Guardian. 10 November 2014. Retrieved 10 November 2014. ↑ "David Moyes' Real Sociedad draw 0–0 with Deportivo La Coruna in Scot's first match in charge". The Daily Telegraph. Reuters. 22 November 2014. Retrieved 22 November 2014. ↑ "Real Sociedad 3–0 Elche". BBC Sport. British Broadcasting Corporation. 28 November 2014. Retrieved 28 November 2014. ↑ Oliver, Pete (4 January 2015). "Real Sociedad 1-0 Barcelona". BBC Sport. Retrieved 6 January 2015. ↑ "Moyes 1-0 Barcelona: The internet reacts to Real Sociedad's win". BBC Sport. 4 January 2015. Retrieved 6 January 2015. ↑ "David Moyes: Real Sociedad boss given two-game La Liga ban". BBC Sport. 16 January 2015. Retrieved 18 January 2015. ↑ "David Moyes: Real Sociedad sack former Man Utd manager". BBC Sport. 9 November 2015. Retrieved 9 November 2015. 1 2 3 4 5 "David Moyes". Soccerbase. Retrieved 26 April 2015. ↑ "United under David Moyes". StretfordEnd.co.uk. Retrieved 26 April 2015. 1 2 "D. Moyes". Soccerway. Retrieved 26 April 2015. 1 2 "David Moyes". League Managers' Association. Retrieved 26 April 2015. ↑ Carr, David (25 October 2010). "Everton boss Moyes signs up Desert Cry". Racing Post. ↑ Logan, Gabby (19 May 2009). "BBC Inside Sport Interview". ↑ "Seaside memorial for Moyes". Coleraine Times. Retrieved 20 May 2009. ↑ Fraser, Alan (10 May 2013). "How a skinny kid with grazed knees became the king of United's new era at Old Trafford". Daily Mail. London: Associated Newspapers. ↑ "45plus45 Thats Football: David Moyes takes charge of Everton for the 400th time today". 45plus45isfever.blogspot.co.uk. 10 November 2012. Archived from the original on 3 December 2013. Retrieved 18 May 2013. ↑ "New Manchester United boss David-Moyes recalls-gritty upbringing on Reds Clydeside". Scottish Sun. Retrieved 10 May 2013. ↑ "Ex-Manchester United boss David Moyes probed over bar 'scuffle'". BBC News (British Broadcasting Corporation). 22 May 2014. Retrieved 22 May 2014. ↑ Laville, Sandra; Bunyan, Nigel; Rawlinson, Kevin (22 May 2014). "David Moyes investigated by police over alleged bar assault". theguardian.com. Guardian News and Media. Retrieved 22 May 2014. ↑ "No action over Moyes 'altercation'". Irish Independent. Press Association. 30 July 2014. Retrieved 6 August 2014. Wikimedia Commons has media related to David Moyes.